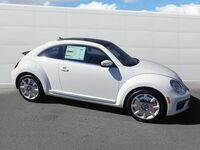 How can you not love the Volkswagen Beetle? This lively little coupe is perfect for drivers who want to see and be seen, sporting its familiar silhouette while adding in modern touches like LED lighting, standout colors, and sporty wheel designs. New for 2018 is the Beetle Coast, a Beetle trim that features "beach-inspired" style like a surfboard wood-look dashpad and a unique Deep Sea Teal exterior color option. Want to stand out even more in your bug? The Beetle Dune trim pays homage to the classic Baja Bug with its rugged features and rambunctious spirit. A new turbocharged 2.0L TSI engine powers all 2018 Beetle models for a drive that's riveting, yet still incredibly efficient with an EPA-estimated fuel rating of 33 miles per gallon on the highway. This engine is then paired with a 6-speed automatic transmission with Tiptronic® and Sport mode that allows the driver to be more in control of how the vehicle shifts and drives. The 2018 Beetle will also get Volkswagen's new People First Warranty, a six-year or 72,000-mile (whichever occurs first) bumper-to-bumper New Vehicle Limited Warranty that can be transferred to subsequent owners throughout its duration. 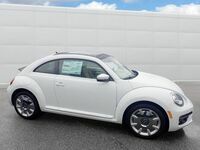 Once inside the cabin of the new Volkswagen Beetle, you will find plenty of impressive standard features like a rearview camera system, power windows with one-touch up/down, and a leather-wrapped multifunction steering wheel, shift knob, and brake lever. For those who can't live without the best, available options like ambient lighting and leatherette seating will have drivers really sitting in the lap of luxury. The center dash of the new Beetle will feature a Composition Color 5-inch touchscreen display that comes equipped with an aux-in and USB (one port) multimedia interfaces, as well as standard Bluetooth® technology for compatible devices. The available 6.3-inch Composition Media display takes it a step further with the intuitive Volkswagen Car-Net App-Connect service, which features Apple CarPlay™, Android Auto™ and MirrorLink®. The 2018 Volkswagen Beetle comes with plenty of active, passive, and driver assistance safety features to provide you with all-around protection in the event of a crash. 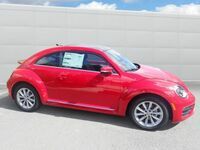 For example, the Beetle features an Automatic Post-Collision Braking system and offers Blind Spot Monitor with Rear Traffic Alert and front and rear Park Distance Control (ParkPilot). 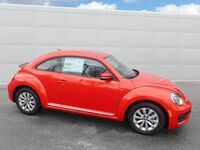 Are you ready to bring home your very own 2018 Volkswagen Beetle? Then get in touch with us here at Dirito Brothers Volkswagen today!